A dog is a man's best friend, and clearly a little girl's too on the evidence of this charming video. This camera footage shows the adorable moment a Siberian Husky gives a baby girl an affectionate kiss on the lips. The two play around with a cuddly toy at a home in North America as their father captures the cute bond between them with his camera. The girl wearing a pink dress delights in watching her canine companion chew on the soft toy before letting the dog give her a kiss on the mouth. The priceless moment is captured on the carpet in the living room at an undisclosed location in America. The two have been together since the girl was a tiny baby and the large dog is always playful around her. 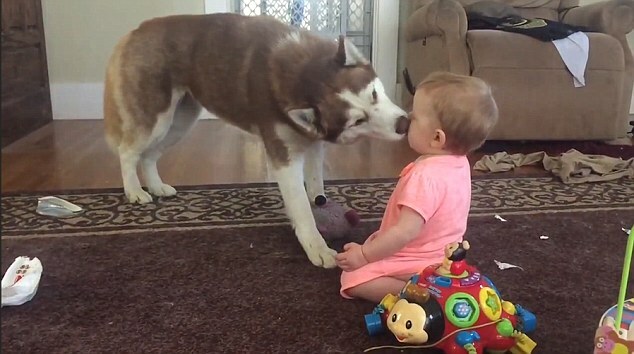 Responses to "A baby's best friend: Husky playfully gives baby loving kisses"